Next performance: Tonight at 8:00 p.m. Publicity for today’s Pasadena Symphony’s concerts proclaimed it as “Mozart and Mendelssohn.” That was an accurate, if incomplete, title, since the program also began with a Schubert overture. 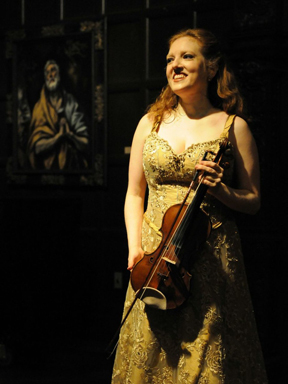 However, Rachel Barton Pine (pictured right), the afternoon’s soloist, had a better description, “Musical Tourism,” as the program began in Italy and continued through Turkey to Scotland, with a detour into Ireland. Principal Guest Conductor Nicholas McGegan was on the podium, conducting as usual without a baton but with his bouncy, ebullient personality and occasionally humorous gestures. Moreover, as usual, the PSO was in top form for him throughout the program, which began with a sparkling account Schubert’s Overture in C Major, D. 591, the second of two that Schubert wrote “In the Italian Style” (the other, D. 590, is in D Major). Principal Clarinet Donald Foster was in the spotlight throughout the performance. Pine, now 42, has rebounded from a gruesome accident on a Chicago Metra train to become one of the nation’s foremost violin soloists. She demonstrated her prodigious capabilities in Mozart’s Violin Concerto No. 5 in A Major, K. 219,, known as the “Turkish” for its final-movement rondo. Playing on the “ex-Bazzini ex-Soldat,” a 1742 violin crafted by Joseph Guarneri “del Gesu,” Pine poured out a lovely, sweet tone throughout the performance, although her desire to create ultra-quiet moments came across as almost too precious in its concept. She reportedly creates her own cadenzas for Mozart concerti and those today were wonderfully suited to the music and the overall performance. As an encore, Pine introduced to most in the audience Heinrich Wilhelm Ernst’s Concert Etude No. 6, which is based on the Irish tune, The Last Rose Of Summer. The work wraps the tune in an introduction and a set of variations and, although somewhat lengthy for an encore, was a big hit with the audience as Pine dazzled with her intricate melding of bowing and pizzicato. After intermission, McGegan led a vigorous account of Mendelssohn’s Symphony No. 3 in A minor, Op. 56 (“Scottish.”) This is actually the last of five symphonies that Mendelssohn wrote, but like Beethoven’s first and second piano concertos and Chopin’s two piano concertos, it is numbered in terms of its publishing date, not the date in which it was written — in fact, it took 12 years from when this symphony was begun, in 1830, until it was finished. Whether it was the gloomy opening, redolent of the dank weather in the Scottish Highlands, or the Scottish-like tunes in the second movement, McGegan bounced things along smartly and the orchestra responded with first-rate playing throughout, sending the audience out into the warm afternoon in the spirit of pleasant joy. • The season’s final concert, on April 29, blends choral music by Ralph Vaughan Williams and Gustav Holst, with Beethoven’s Symphony No. 9 with its “Ode to Joy” choral ending. In addition to the orchestra, the program will include four soloists, the Donald Brinegar Singers, JPL Chorus and the Los Angeles Children’s Chorus. This entry was posted in Uncategorized and tagged Ambassador Auditorium, Nicholas McGegan, Pasadena Symphony, Rachel Barton Pine by Robert D. Thomas. Bookmark the permalink.